With a name that translates to "a giant thunderclap at dawn," the dinosaur species that was recently discovered by researchers in South Africa must have been quite a sight during the early Jurassic period when it lumbered around the Earth. The skull of the 12-ton animal has not yet been found, but vertebrae and limb fossils have given the team a lot of information about the massive animal that lived approximately 200 million years ago. Ledumahadi mafube (in the indigenous South African language Sesotho) is a relative of the brontosaurus that weighed in around 26,000 pounds. In a study published in the journal Current Biology, the University of Witwatersrand in Johannesburg paleontology professor Jonah Choiniere and his team share details about the fossil discovery. 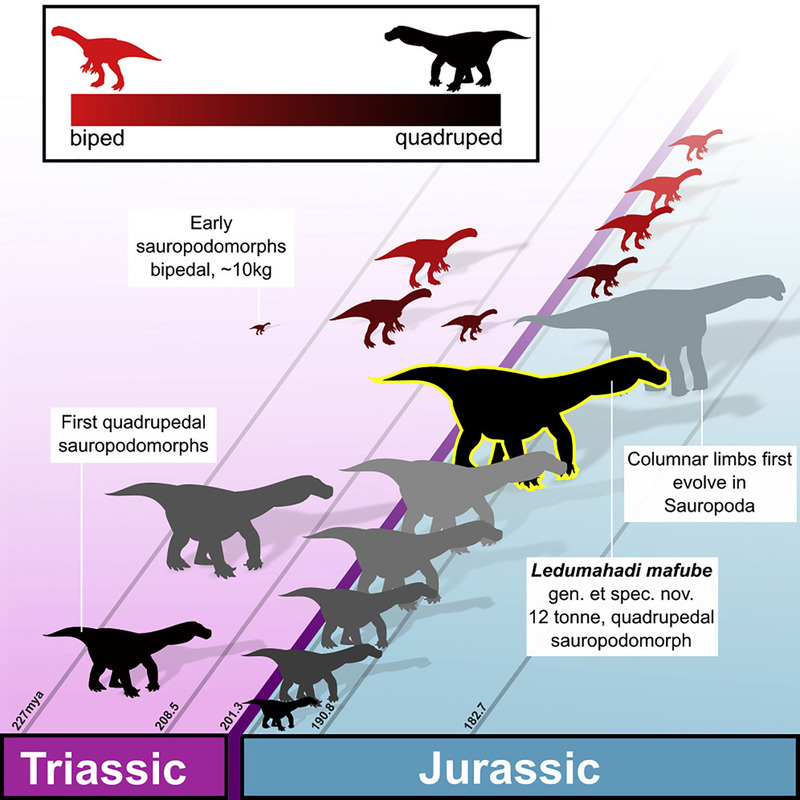 Based on the circumference of its forelimb and hindlimb, the researchers compared the dinosaur to other dinosaurs, reptiles, and animals to determine its posture and classify it as being a quadruped. "The first thing that struck me about this animal is the incredible robustness of the limb bones," said Blair McPhee, study lead author and one of Choiniere's graduate students. 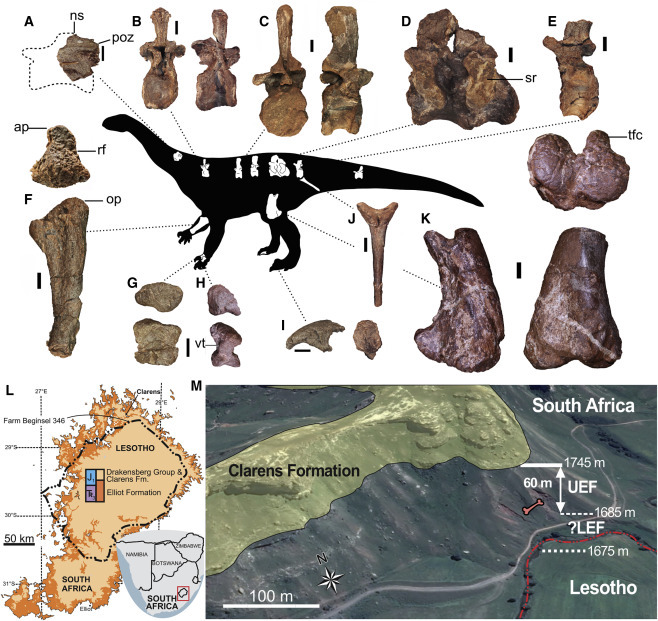 "It was of similar size to the gigantic sauropod dinosaurs, but whereas the arms and legs of those animals are typically quite slender, Ledumahadi's are incredibly thick." This also lead researchers to believe the dinosaur had an awkward semi-crouched stance described as "cat-like," with its joints partially flexed (and presumably ready to pounce). The discovery of Ledumahadi mafube and its relation to giant species that lived in present-day Argentina also supports the idea that all the continents were once connected as one large Pangea, Choiniere said. "It shows how easily dinosaurs could have walked from Johannesburg to Buenos Aires at that time." Dinosaur discoveries in South Africa date back to 1845 and include the 1.2-meter long Heterodontosaurus, the 8-meter long Aardonyx, and the 12-meter long Melanorosaurus. "Not only does our country hold the Cradle of Humankind, but we also have fossils that help us understand the rise of the gigantic dinosaurs," South Africa's Minister of Science and Technology, Mmamoloko Kubayi-Ngubane, said in a statement. "This is another example of South Africa taking the high road and making scientific breakthroughs of international significance on the basis of its geographic advantage, as it does in astronomy, marine and polar research, indigenous knowledge, and biodiversity."